A huge thank you! to everyone who made our first diplomat training such a wonderful time. A ‘Bioregional Educators’ Toolkit: The creation of a Cascadian Educators toolkit and resource guide for educators to be better able to incorporate bioregionalism and talk about Cascadia and our own bioregion in a better way. This will also culminate in the hosting of a round table discussion of Cascadian and indigenous educators within the Cascadia movement to discuss and better identify needs. ‘Seattle Cascadia Running’ Group: A Seattle based Cascadia runners group, which will meet regularly to slowly work up to participating in more official fun runs and the Seattle marathon. 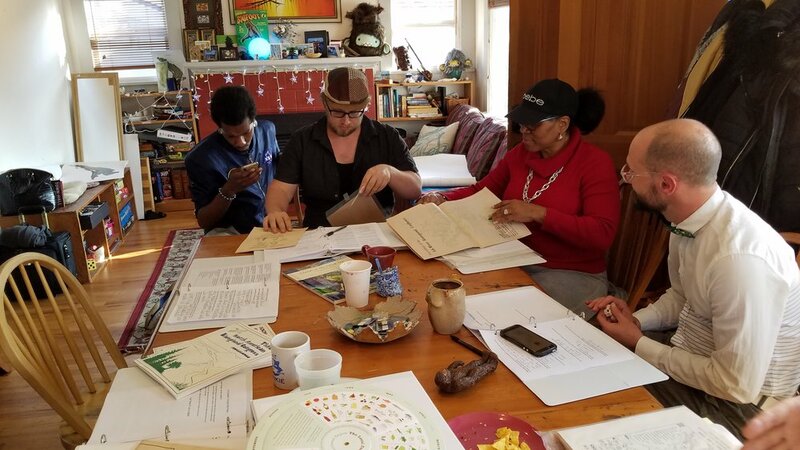 The group will meet in different areas each gathering, to learn about and break down some of the geographic segregation and isolation of different neighborhoods in Seattle. They will also partner with the Seattle marathon to introduce waste free water drinking stations, rather than the reliance on water bottles each year. ‘Bioregional Pie’ Art Project: An illustrated art piece showing the different layers of bioregionalism as slices of a pie, including diet, transportation, economy, leisure, lifestyle and civil rights, as the image winds itself from a fragmented world to a transitioning bioregional one. The illustration will be used in pieces as an educational resource. Cascadia Image Archive: Trying to create and compile a visual archive of the Cascadia movement over the past 40 years that can be both informative and inspirational. Chinook Wawa Dictionary & Language Guide: The creation of a collective Chinook Wawa & Jargon resource, with informative words of the day to help give broader context into the first true Cascadian trade language. Camp Cascadia & Summer Camping: The creation of open camping at a location in southwest Washington for Cascadian passport holders and ambassadors in the July & August months with the goal of providing a specific place where Cascadians can come, meet, have a great time and enjoy some beautiful sun and summer activities. If you couldn’t make the training - join us each week! We host Cascadia work parties every Thursday. Each meeting is an open potluck and starts with introductions, discussions, and how to talk about Cascadia. We start with the ‘hard questions’ - how better to talk about Cascadia as well as on going challenges (and the things that have been working for us), combined with some awesome group work time, one on one feedback, and project breakouts. Miss this one? Our next Cascadia Diplomat Training is in Seattle on May 12th. Food is provided. $20 donation. Please register early, as these events are capped at 10 people. Come prepared with a project or idea you would like to lead, or join an already existing project.